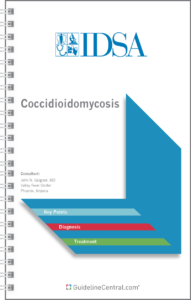 The Streptococcal Pharyngitis: Diagnosis and Management GUIDELINES Pocket Guide is based on the latest guidelines of the Infectious Diseases Society of America (IDSA) and was developed with their collaboration. This practical quick-reference tool contains key points, diagnostic recommendations, a management algorithm, and antibiotic therapy information for both acute and chronic carrier states. The Infectious Diseases Society of America (IDSA) represents physicians, scientists and other health care professionals who specialize in infectious diseases. IDSA's purpose is to improve the health of individuals, communities, and society by promoting excellence in patient care, education, research, public health, and prevention relating to infectious diseases. Group A ß-hemolytic streptococcus (GAS) is the most common bacterial cause of acute pharyngitis, responsible for 5%-15% of sore throat visits in adults and 20%-30% in children. Although acute pharyngitis is one of the most frequent illnesses for which pediatricians and other primary care physicians are consulted, with an estimated 15 million visits per year in the U.S., only a relatively small percentage of patients with acute pharyngitis (20%-30% in children, fewer in adults) are infected by GAS pharyngitis. Moreover, the signs and symptoms of GAS and nonstreptococcal pharyngitis overlap so broadly that accurate diagnosis on clinical grounds alone is usually impossible. To minimize potential adverse effects of inappropriate antimicrobial therapy. Penicillin or amoxicillin remains the treatment of choice, and azithromycin, clarithromycin, clindamycin or a 1st generation cephalosporina for the penicillin-allergic patient. With the exception of very rare infections by certain other bacterial pharyngeal pathogens (e.g., Corynebacterium diphtheriae and Neisseria gonorrhoeae) (Table 2), antimicrobial therapy is of no proven benefit as treatment for acute pharyngitis due to organisms other than Group A streptococci. Therefore, it is extremely important that physicians confirm the diagnosis of GAS pharyngitis to prevent inappropriate administration of antimicrobials to large numbers of patients with non-streptococcal pharyngitis. a Unless reaction to a penicillin was anaphylactic. Swabbing the throat and testing for GAS pharyngitis by rapid antigen detection test (RADT) and/or culture should be performed because the clinical features alone do not reliably discriminate between GAS and viral pharyngitis except when overt viral features like rhinorrhea, cough, oral ulcers and/or hoarseness are present. In children and adolescents, negative RADT tests should be backed up by a throat culture (SR-H). Positive RADTs do not necessitate a back-up culture because they are highly specific (SR-H). Routine use of back up throat cultures for those with a negative RADT is not necessary for adults in usual circumstances because there is a low incidence of GAS pharyngitis in adults and the risk of subsequent acute rheumatic fever is generally exceptionally low in adults with acute pharyngitis (SR-M). Physicians who wish to ensure they are achieving maximal sensitivity in diagnosis may continue to use conventional throat culture or to back up negative RADTs. Anti-streptococcal antibody titers are not recommended in the routine diagnosis of acute pharyngitis since they reflect past but not current events (SR-H). Testing for GAS pharyngitis usually is not recommended for children or adults with acute pharyngitis with clinical and epidemiologic features that strongly suggest a viral etiology (e.g., cough, rhinorrhea, hoarseness, and oral ulcers) (SR-H). Diagnostic studies for GAS pharyngitis are not indicated for children < 3 years old because acute rheumatic fever is rare in these children and the incidence of streptococcal pharyngitis and the classic presentation of streptococcal pharyngitis are uncommon in this age group. Selected children < 3 years old who have other risk factors such as an older sibling with GAS infection may be considered for testing (SR-M). Follow-up post-treatment throat culture or RADT is not recommended routinely but may be considered in special circumstances (SR-H). Diagnostic testing or empiric treatment of asymptomatic household contacts of patients with acute streptococcal pharyngitis is not routinely recommended (SR-M).